So, why do we keep having this problem? Confession time, my little chinchillas. I’m a nerd. No. I mean, I’m a nerd. A D&D playing, glasses wearing, bad-horror-movie-quoting nerd. Need proof? 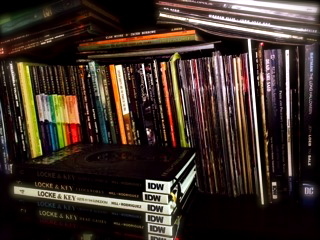 Here’s one of my four embarrassingly overburdened comic book shelves. Which means, of course, I love Superman in any and all forms. Even the old TV show the Adventures of Superman, starring George Reeves. But something has always bothered me about the show. So, again with the creepy, Facebook? Facebook. Sweetie. Boychik. Come here. We have to have another chat. About the creepy. I know that you want to be all things to all people, and that now you have stockholders to earn for. And hey, new features build buzz and keep folks in the app, rather than zipping over to Yelp to find restaurants and reviews. So, is Twitter gonna get creepy? As you’ve no doubt heard, Twitter is talkin’ turkey about making changes. And the user base is…let’s say less than thrilled. So, what does storytelling require, anyway? I’m so glad you asked! You’re my favorite. Don’t tell the others. It’ll be our little secret. The short answer is that storytelling is narrative and narrative is driven by conflict. The long answer? Let’s dig into the guts of that. So, this is extra-crispy levels of creepy. I don’t usually blog two days in a row, but for poor Comcast, I’ve made an exception. Slip on over to Fast Company and read about the most terrible bit of storytelling since Spiderman 3 hit us with that dance sequence. When someone wants to cancel a contract or service, yes, by all means, ask if there’s anything you can do to help change their mind. Once. Not for twenty minutes. This is a serious case of narrative fail. Customer service reps have to be able to understand the customer’s desires, interpret mood and motivation. They have to tell the right story in response. Social intelligence, just as we discussed before. I’m inclined to think this will go viral, especially since the recording is so easily shared via Soundcloud. But if nothing else, said recording certainly is instructive.